In the last 15 years there has been a dramatic surge in the public’s use of technological devices.1,3 In this time of rapid technological growth, PTs have access to new solutions for improving compliance—one of which lies in the palm of our hands. Smartphone and tablet applications are readily available, familiar, and ubiquitous tools at the fingertips of most clinicians and patients. HEP software, which merges technology and patient care, has opened a new door for accessibility and personalization. We’ve written before about the top HEP software programs for physical therapists. Unfortunately, this technology continues to be grossly underutilized and unstudied. HEP software could potentially serve to revolutionize patient outcomes by dramatically increasing rates of patient compliance. Some believe that the answer to the non-adherence problem is through accessibility and personalization. Research shows that this is not an anecdotal observation but a phenomenon confirmed by data. Studies show that 70% of Americans want personalized online experiences.4 Personalization requires a good knowledge of the users–their environment, preferences, behavior. More than this, the ability to collect and process the data of the clients is essential for any online software. The biggest problem currently in the outpatient clinic setting is complacency. Many clinics I have seen have to balance the financial costs of upgrading software with declining reimbursement rates and other challenges. As of late, this issue leads to individual therapists having to invest in the software if they feel they have not been able to change their clients’ adherence using older technology. In 2008, Heidi Jannenga—a physical therapist and the director of a large clinic in Arizona—teamed up with Brad Jannenga to launch WebPT, a PT-focused electronic medical record (EMR). Since then, WebPT has grown into a multi-product solution, providing rehab therapists with all the tools they need to run their clinics efficiently—from documentation and billing software to patient engagement technology and a digital HEP. WebPT has changed the way physical therapy practices—including small, independent clinics as well as large, multi-location chains—operate their businesses and deliver care to their patients. The company’s product suite includes EMR, scheduling, billing software, analytics, outcome measurements, patient relationship management, and a recently updated HEP software, which allows patients and providers to access a comprehensive exercise library on any smartphone via the StriveHub mobile application. WebPT’s new HEP software provides a novel way for PTs to engage with patients of all age ranges. Physical handouts of the HEP can help older adults who may not be as adept or interested in mobile technology. The mobile application by Strive Labs can improve adherence in the younger population with a plethora of HD videos and detailed written descriptions. Many clinics use WebPT as part of their documentation and billing system. Clinics can use WebPT’s EMR and HEP software concurrently, which means users don’t have to log in to another website or software in order to create the HEP. WebPT also created an access tab as part of each client’s file. The HEP software is accessible via the client’s chart and on the dashboard home screen. Because the client’s HEP program is part of his or her chart, other therapists have access to it if needed (e.g., in a clinic where therapists have staggered schedules and a client may see more than one therapist during the week). When I created a program for myself to test the software, it took me roughly 3 minutes. That means therapists can, in many cases, create programs during a client’s therapy session and give them to the client in multiple formats (online and hardcopy if needed). The HEP interface is accessible anywhere the PT has internet access. A permanent computer location in the clinic is not necessary to create and issue these programs. The software also allows the therapist to continuously monitor patients’ progress and modify the program on the go through both the online software and the mobile application created by StriveHub. I’ll touch on this point again, but the ability to send exercises in the form of video clips and detailed written descriptions further decreases the need for the physical therapist to spend an excess amount of time teaching the client the HEP (form, technique, reps/sets, etc.). The mobile application StriveHub allows the therapist and client to communicate about the HEP outside of the clinic. When the therapist creates the HEP within WebPT, it automatically sends an email to the client with a link to download StriveHub. Clients can then access their HEP anytime, anywhere. Client goals are created at the initial evaluation and transferred to the application, where they can be modified based on client progress. Most importantly, the system is completely secure, so messaging is private and only occurs between the therapist and the client. Clients can easily download the mobile application on the App Store and Google Play. The platform incorporates some interesting data analysis that gives physical therapists a picture of how often their clients log in into the application and the percent of individuals who complete their care plan. It also provides real-time notifications when clients read their secure messages or complete their workout plans. With this, therapists no longer have to ask clients at the beginning of their sessions, “Did you do your HEP yesterday?” Instead, therapists can confirm that their clients performed their programs and address any obstacles to completion. Furthermore, clients can use a secure messaging system to promptly contact their therapists with any pertinent information—like if they experience pain while performing an exercise. The HEP software notifies the therapist not only through the HEP portal, but also via the email used to set up the application. It encourages a continued alliance outside of the clinic, which further progresses trust between client and clinician. In fact, many studies indicate that the therapeutic alliance is the best predictor of treatment outcome.8 Furthermore, the ability of the therapist to respond to these online messages contributes to the client being “heard.” Current data suggest that positive effects occur when people feel empowered and believe that they have been “heard.”9 Plus, patients can supply feedback and ask questions directly within the StriveHub app while performing the HEP exercises in real time, making them less likely to put off doing their exercises due to confusion or uncertainty about proper form or other exercise details. I used the messaging function with my clients and found that this created a better bond between us; furthermore, functional and pain scales during the string of treatments improved substantially, as did exercise retention. One aspect that needs to be considered with this change is the effectiveness and genuineness of communication provided both in the clinic and outside of it via the platform. Stenmar and Nordholm10 investigated clinicians’ perceptions of the most important factors in successful treatment in their sample of 187 Swedish physical therapists and found that the majority perceived the patient-therapist relationship and patients’ resources to be more important to treatment success than the treatment itself. Despite the importance of communication, there is no gold-standard instrument for measuring communication, and various methods have been used within the healthcare fields. Exercise selection and dosage are the keystones to any rehabilitation program in the physical therapy arena. Physical therapists use different exercise paradigms to affect the level of pain and function in their clientele. The range of populations requires an adaptable program that can address various presentations. 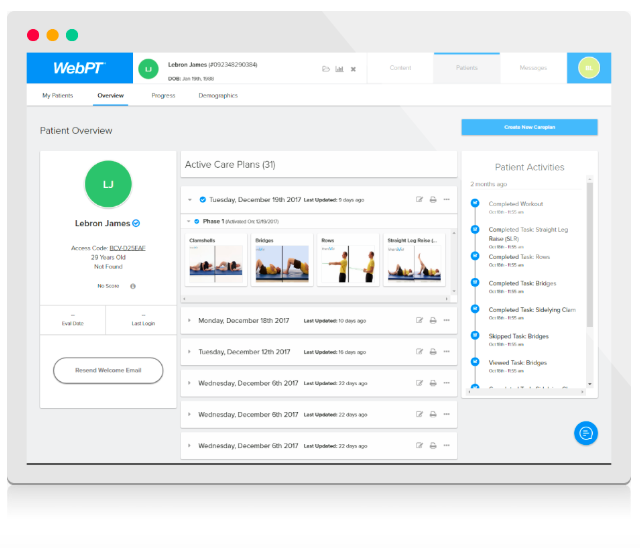 WebPT’s HEP software contains a bountiful exercise library with an array of options, from therapeutic exercises based on body part or plane of motion, to educational vignettes on positional management for edema, to gait training/ADLs. The therapist can search by keyword, body part, or diagnosis, and receive recommendations based on currently prescribed exercises. Therapists can also create templates for commonly treated conditions in their clinics. The templates are saved and can be accessed indefinitely and edited if the frequency and duration of the exercises need to be individualized for new clientele. The exercises can be provided in multiple mediums. This includes an HD video format (thousands of videos are available) via the online portal and printable handouts for those individuals who like hard copies. Each video has a detailed description to help improve client understanding and retention of specified exercises. Home exercise programs that include the video format have been shown to improve client compliance. 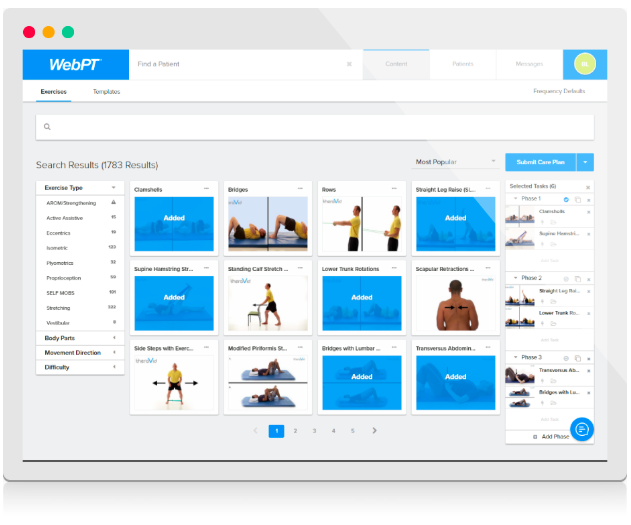 WebPT has added hundreds of new exercises over the last few months, with continued plans to add more content through the next year focused on specialities. Content will be added regularly and the therapist will be continuously notified of these additions. Using the video format has been a huge help for me: my clients have felt that it has cut down on their questions regarding how to perform the HEP and feel they get more results from in-clinic treatment. In order to reach a broader audience there are a number of the exercise programs available in 8 different languages. Thus, the clinic can reach a broader client population with the use of this HEP technology. There is a huge reduction in paper costs with clients/therapists using the mobile application/web interface, as it saves at least 4-6 pages of paper with each client (including duplicates for record keeping). If you are in a clinic that sees 300-350 clients a week, then this software can really save on overhead in the paper department alone! Furthermore, most other EMR systems do not contain the HEP software function and require the clinic to purchase further HEP software, which increases overhead. With the WebPT EMR system, however, the HEP comes included with the price of WebPT’s EMR software. For midsize outpatient clinics with fewer than or equal to 20 therapists, that price can be as little as $3/day. Lastly, I like the fact that some other HEP software out there are starting to provide a platform to allow physical therapists to record themselves performing the exercises. The client receives an even more personalized experience using this method. There are times that even with a thousand exercises available, the therapist might think of something new. They are now able to get these unique activities to the client for repeated viewing. For some clients, the use of technology like WebPT’s HEP software could seem burdensome. 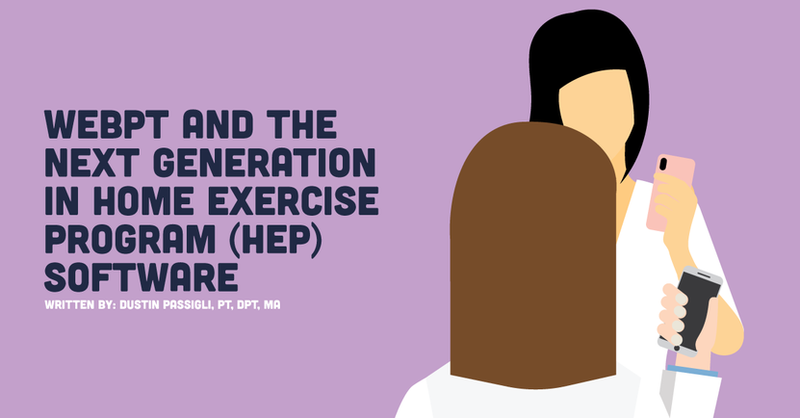 Providing a home exercise program (HEP) to patients is one of the most fundamental and important aspects of physical therapy. Unfortunately, it has also been shown that, in general, patients adhere poorly to their prescribed home program, with varying estimates from research1. Advances in mobile technology continue to have immediate and long-lasting effects on our healthcare system and in particular HEP software. The goal of WebPT’s new software is to create a seamless experience for the client that improves engagement and accessibility in order to improve health outcomes. This technology can help improve the level of communication and engagement when the client transitions to a more home-based therapeutic program. With worsening reimbursement and changes to the number of visits authorized by government-sponsored/private health insurances, home programs are essential. Consequently, if our healthcare system transitions to an outcome-based reimbursement infrastructure, then improving adherence to HEP is paramount. Henry KD, Rosemond C, Eckert LB. Effect of number of home exercises on compliance and performance in adults over 65 years of age. Physical Therapy. 1999;79(3):270-277. Riel H, Matthews M, Vicenzino B, Bandholm T, Thorborg K, Rathleff MS. Efficacy of live feedback to improve objectively monitored compliance to prescribed, home-based, exercise therapy-dosage in 15 to 19 year old adolescents with patellofemoral pain- a study protocol of a randomized controlled superiority trial (The XRCISE-AS-INSTRUcted-1 trial). BMC Musculoskeletal Disorders. 2016;17:1-12. Smith A. U.S. Smartphone Use in 2015. 2015; http://www.pewinternet.org/2015/04/01/us-smartphone-use-in-2015/. Simek EM, McPhate L, Hill KD, Finch CF, Day L, Haines TP. What are the characteristics of home exercise programs that older adults prefer? : A cross-sectional study. American Journal of Physical Medicine & Rehabilitation. 2015;94(7):508-521. Martin, D., Garske, J., and Davis, M. (2000) Relation of the therapeutic alliance with other outcome and other variables: a meta-analytic review. Journal of Consulting and Clinical Psychology, 68, 438-450. Stenmar L, Nordholm L. Swedish physical therapists’ beliefs on what makes therapy work. Phys Ther . 1994;74:1034–1039.